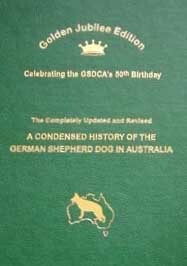 To celebrate the German Shepherd Dog Council of Australia Inc.’s 50th Birthday, a complete revision and update of the original 1990 Historical Edition is available. A total of 864 pages in size and containing thousands of GSD photographs from all eras, mostly in colour, this publication charts the history of the GSD in Australia from before the formation of the Council in 1960, through the lifting of the infamous 43 year GSD import ban in 1972 for a trial period of one year, then permanently in 1974. This book also contains a series of captivating articles, historic records and other fascinating information to make a truly great read, as well as providing an unsurpassed, invaluable, permanent reference source. Copies of the GJE remain available for purchase. Download the purchase form.